Although Hawaii seems to beckon its fair share of honeymooners, retirees, and parents looking to reconnect as a couple, Hawaii really IS a great place to bring children of all ages. And lots activities around the islands are ideal for children of all ages, from toddlers to teenagers. When it comes to ocean activities, however, you’ll want to do your homework if you’re traveling with little ones. Certain ocean excursions may be too dangerous for small children (ages 2-10), but perfect for adolescents. And some may bore your teenagers, but delight your young ones. 1. Stand-Up Paddleboarding: I would have thought small children don’t have the balance required to handle a stand-up paddleboard, but I’m dead wrong! Little ones have fantastic balance on a paddle board due to their lower center of gravity. But, handling the paddle and mastering the technique can take young children some time to learn. Some stand-up paddleboarding companies require that children 12 and under take a private lesson with the instructor, but most companies we found will teach children as young as 3. So, if you’re willing to pay a little more, your child can participate in this fantastic activity. 2. Surfing: If you sit and watch the waves off Waikiki long enough, you’re bound to see some little tykes surfing the waves like a pro. Some look young enough to still be in diapers! But, for visitors who don’t have a lot of surfing experience, 5 years old and up is the ideal time to take a first surf lesson. 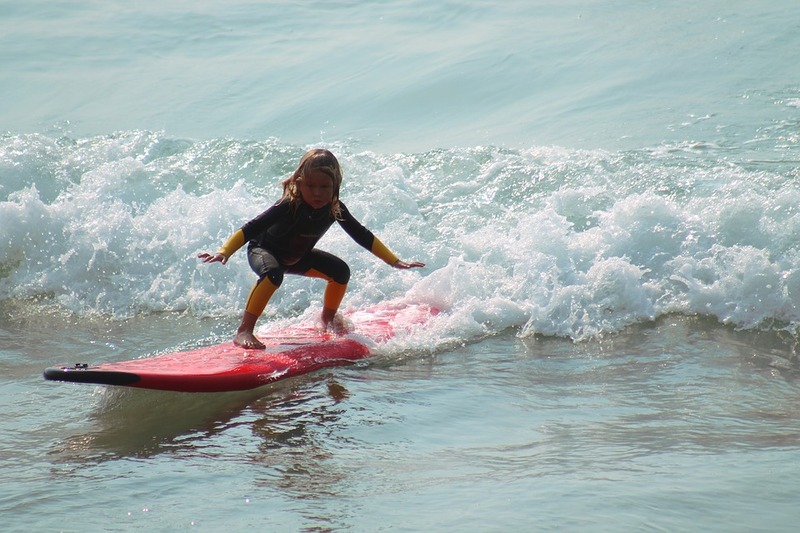 Some surf schools like Ty Gurney Surf School even host surfing birthday parties for those ages 6-15! If you want to sign your little one up for a surfing lesson, be prepared to pay for a private lesson. Like stand–up paddleboarding, some companies like Hans Hedemenn Surf School require those under the age of 14 to take a private lesson. As long as a child can swim, there are few restrictions on surfing in Hawaii. Many local children are surfing as toddlers! 3. 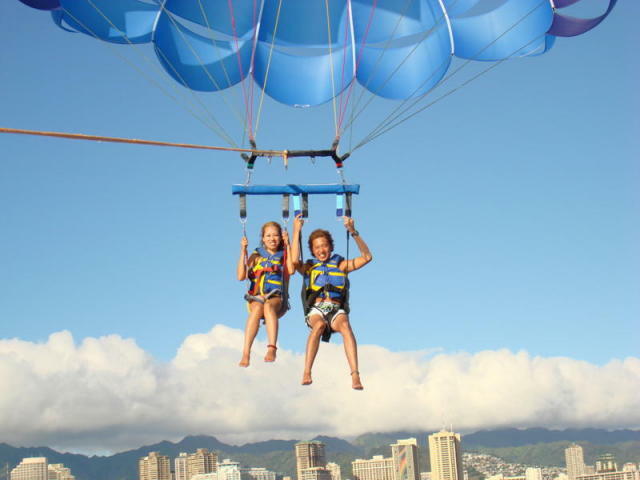 Parasailing: I was shocked to learn that many parasailing operators in Hawaii will take children as young as 5 years-old for a ride, but that could just be because I’m scared of heights! When you book a parasailing adventure through Hawaii Aloha Travel, you know you’re in good hands. But, if you book on your own, make sure you ask a lot of questions about child-specific regulations. For example, some compaines will take children as young as 5 for a ride, as long as he is accompanied by a paying adult. And, older teens can go for a ride, but a parent must be present at the dock. If you plan to allow a child to parasail, make sure you take all considerations into account: your child’s fear/fearlessness, height/weight, and ability to stay calm in an uncertain situation. Last thing you want is a panicked child! 4. Banana Boat Ride: At Hawaii Water Sports Center near Koko Marina, your family can enjoy a ride on a six-person, inflatable “banana” towed behind a boat. If you have small children who are able to swim, this may be a fun and exciting adventure for the whole family. Hawaii Water Sports Center will take children as young as 4 years-old on a ride, so grab your life jackets and shake a tail feather! Many parasailing operators will allow children as young as 5 years old to participate, but there are often strict restrictions. So make sure you call ahead! 5. Jet Ski: At H2O Sports, young children are welcome to join-in on the fun, but your child must be 16 years old or older to drive. To boot, children under 5 who want to watch from the boat are free! Jet skiing in Hawaii with young children can be exciting and safe, but this is another case where your child’s temperement and maturity will tip the scales. Another bonus to jet skiing with children? Not just your young children, but older kids too will think it’s a thrill! When you’re looking for ocean activities for children in Hawaii, the choices are abundant. But, ultimately, it’s up to you to decide which is right for your child and learn about any restrictions when venturing out with young children, especially. But, introducing your children to ocean sports is a great way to bond as a family, while giving your children a safe and exciting adventure!